1955 Dodge 1/2T Pickup, C3B. Short/lowside box. $3500, Richland, WA. This pickup originally came with the flathead six, but has been replaced by others with a 318 Poly V8. The truck has not run for about 6-7 years -- just sitting, but should run with simple maintenance/startup procedures. It is a four speed on the floor. The body is in good shape. the only major body damage is the rear driver fender, and those are easy to replace/find (or this could be repaired). Floor is solid with surface rust. There is some rust on the bottom of the passenger door, but not too bad. All glass but passenger door is without cracks or any major delamination. The curved windshield appears in good shape. These lowside boxes are rather rare today (as are Dodge pickups of the 50s). I also have an option for you to buy a 1954 Chrysler 331 Hemi V8, which would be a real nice combo to go with this truck -- the engine turns freely and has the original carb with it which is in good shape. (truck comes with the 318 V8 regardless). Will not sell hemi engine separately. No trades. Price for truck and hemi is $5000. 1929 Dodge-Brothers identification: Victoria or Brougham ? I am putting a 39 desoto overdrive trans in a 37 dodge coupe. This OD trans has a solenoid ,but does not have a rail lockout switch or a governor(no provision for either). How does this trans sense engagement speed? I have manuals for the non electric B-W OD and the fully electric B-W OD for 1940 and up, but the 39 B-W OD seems to be the cross over year and I can find no info at all. Any help will be appreciated. I am installing a stock radiator in my '37 pickup. When I fit it in there is a large space between the radiator and the cross member underneath. Anyone know if I am missing a mounting block, My repair manual make no mention. Thanks. 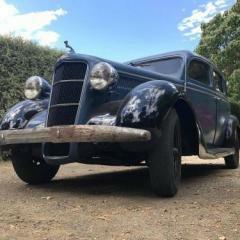 HI there, we (group of mates) have just purchased a 1947 Dodge DD4 60 canadian build truck and are going about restoring it. It is about 90% complete however all in parts. We are having problems finding a manual and are all new to restoring, but have started by breaking it down back to the chassis. Any info or tips would be great. I am offering for sale the following parts for a first generation Dodge Brothers Touring Car which were sold to me as being 1917. All the parts are in need of restoration. 4 front and 2 rear Fenders - $600.00 OBO Gas Tank - $150.00 OBO Wood Spoke Wheels, front and rears with Brake Drums. - $500.00 OBO Front Axle, Spindles, Bearings, & Steering Linkage - $300.00 OBO Parts are located in Woburn, MA 01801 I would like to see these parts go to someone who can use them, the sooner the better. Please don't hesitate to make an offer on all or one of any of these parts. The car itself is not being offered for sale at this time but I would entertain offers on it. More detailed photos upon request. Would it hurt the value of my 71 charger 500 if I replaced the original 318 with a larger engine? For sale a complete rolling chasis 1940 Dodge 4X4 Pickup VC3? Military , the cab and bed have been disassembled I have almost all the parts to make it complete or use the parts. Needs new home awesome truck when restored. I have too many projects. Asking $3500.00. If you have any questions please feel free to call me 570-758-4334. I am located in central Pennsylvania. Barn fresh complete rolling chassis 1940 Dodge Pickup the cab is disassembled needs major restore. Most parts are there. For parts or repair. $3500.00 can email more pictures if you are interested. Call 570-758-4334 I am in Central Pa.
Hi, my father has a friend who has some old cars in his yard. They've been there for, at least, 20 years, so they are ruined. Either waym we think we could buy one of those and either sell it for a profit or just repair it ourselves. The car in question is a Dodge, whose model or year is unknown to us, I think it should be from the late '60s or early '70s. Take a look at the pictures. Thank you for your help. I am looking for a good condition Dodge Brothers touring car 1917-1919 fender for the drivers side rear. Just taken out of garage after long time parked. Ambitious restoration or great parts car. Car is complete all there. Please call Joe at 773-720-6989. $1600 obo. Hey Everyone, I'm hoping to get some help on this one. I got a 1923 Ford T-bucket that someone put what appears to be some classic Dodge Plymouth Chrysler front drum brakes on (probably from the 1937-40s). The brakes are ruined and I'm using this as an opportunity to convert to disc brake. Problem is that I'm not really able to identify the spindle. Anyone got any thoughts? Attached pictures of drum and spindle.